New Traditions with a Flash Giveaway! This Thanksgiving has been super fun! For the first time ever we participated as a family in a 5K walk to benefit a local charity. There were over 15,000 people from across the country participating in the event. Many of them were runners, but we walked. I am in pretty good shape but am not a runner!! We went with my mother-in-law, sister-in-law, her husband, and our neighbors. Here are some fun pics of us before and during! My sister-in-law brought the boas, so we could easily spot each other! My neighbor, Robyn, pushed Ginny Beth for a while! Zack photo bombed this one that I tried to take! Then we ate all of those calories we burned with family and some other neighbors! It sure was fun! My neighbor who I walked with and I went to Target for the 9 o'clock opening, so I could get Ginny Beth's gift, but I ended up with a whole cart full! It was so much fun!! This will be a new tradition each year. Funny thing was I saw my sister-in-law, who we walked with, and her husband two people behind us in the checkout line. Crazy, crazy! We decorated the house all day yesterday, and it feels so good to have it all done! I ordered my yearly calendars from Snapfish while they had their great deals and ordered my Christmas cards from Shutterfly with all of my Pampers points. Yep! I got the cards for FREE!!! Can't beat that deal!! Today we stayed home and just hung out. I watched the UVA vs. VA Tech game, and was disappointed in the loss for UVA. I have to say it was a good game! One day we will be victorious!!! 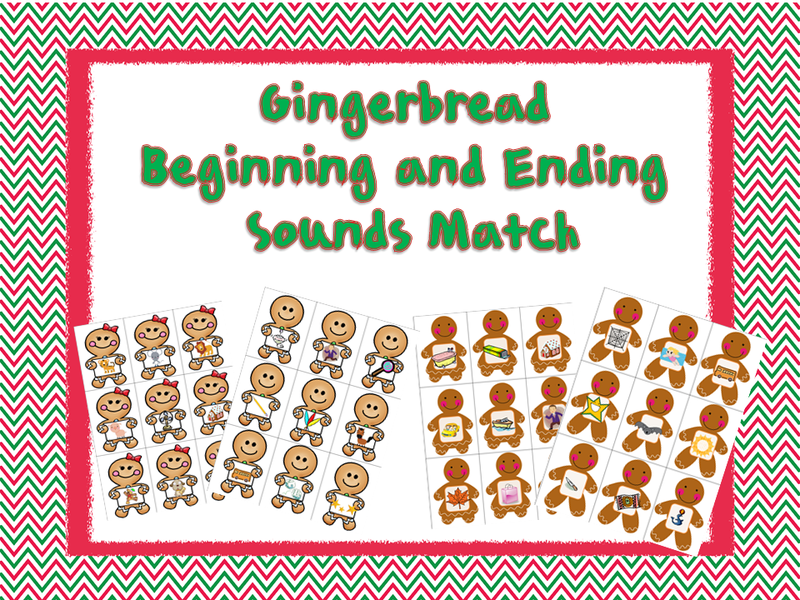 I also finished up my Gingerbread Ending Sounds Match Game. Students match the ending sounds pictures on the gingerbread ladies to the corresponding picture on the gingerbread men. I then bundled the Beginning Sounds and the Ending Sounds Games for one price. These will be half price through Sunday and then included in the big sale on Monday and Tuesday! Click here or on the picture below for the bundle and here for the Ending Sounds Game. I will give away one of these bundles to one lucky winner. (I have already done giveaways for each individual game on Facebook. If you don't follow me there, click here to follow my Facebook!) To enter, leave a comment below telling how you will use this with your students. I will use the Random Number Generator on Sunday after I put the kids to bed (around 8 PM) to pick a winner! Don't forget about the big sale! I am filling my cart now, so I can check out quickly on Monday! I can't wait!! Something else I have been eyeing is one of the Electronic Talk Bars from Learning Resources. Amanda is giving one away at her blog Teaching Maddeness, and now is your chance! Go enter before it is too late. Plus, she has a Purple Cow Laminator to give away too! I will use it as a matching or memory game! It is too cute! I will use it with my RtI groups. My special education boys would love matching the pictures and practicing letter sounds. I will use it as a center for practice & with my struggling students. I would use it in my December Pocket Chart center and/or during small group. :) Crossing my fingers! I would use this as one of my centers during literacy time. Thanks for sharing your work. p.s. I too walked on Thanksgiving day - the Turkey Trot in Clearwater, Fl. a 5K. Have done it as a family for the past 5 years. I would use it as a matching game. These would be great to use with me lower firsties who need to develop their phoneme isolation skills! I would use it as a matching game! I work with such a wide range of grade levels for AIS that I 'm sure I will find multiple ways to use this. Thank you to everyone for entering! It was fun to read all the ways you will use this in your classroom!